When you want the best - The Deluxe S-SE06 Fibre Glass Wing Joining Kit - Why leave gluing your wings together to chance? All you need to join a pair of foam wings in one simple kit. Fast cure, high strength, thin epoxy glue and a length of 4" wide fibreglass wing bandage. Just mix the contents of the two pots together and apply. 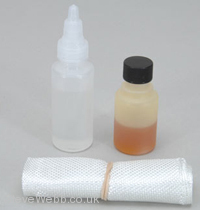 Here is a Glue Pack that we have sold for 20 years or more. This product must be holding 1000's and 1000's of wings together over the years. Its a Deluxe Product and there for can be relied on.